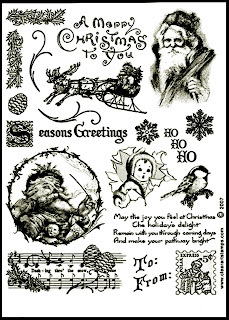 Most of you are familiar with this beautiful Stamp Set since it was my blog candy last week. This set of 18 separate stamps is one of Crafty Secrets most popular sets. Likely because of the amazing detail. All of the pieces offer lots of creative options for dressing up Christmas cards, gift tags, wrapping paper, holiday layouts and more. Check out the card below that I have done using the small child stamp. This large set sells for $24.95 plus shipping. Please e-mail me with your preferred payment and your zip code. I accept Visa, Master Card and Paypal.